Painting your cabinets, flooring and walls in neutral colours such as grey, white, and beige gives your kitchen a more classic look in addition to making it look more spacious. They also allow the architectural details in your kitchen to stand out more so that it looks better designed. They work well with all types of designs and help you to save money as you rarely get tired of them as opposed to bright colours which may start to seem too loud after a while. 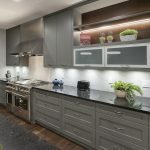 Investing in high end appliances gives your kitchen a more modern look in addition to offering other advantages such as energy efficiency and lasting longer than older options. You should invest in the following appliances that make your kitchen look more elegant and expensive: refrigerators, food processors, microwaves, blenders, toaster ovens, dishwashers, chimneys and others. Many people who are looking to buy a house want to ensure that there is ample kitchen space, especially if they are raising a family. Knocking out a wall or two and expanding the space of your kitchen will definitely raise your house’s value, especially if you make the new addition with a modern kitchen design with new appliances and fixtures. Cooking shows are all the rage nowadays and every foodie wants to recreate their favourite TV chef’s kitchen. Purchasing a few appliances that mimic those found on cooking shows or changing a few fixtures and fittings to the same effect can make your kitchen look more attractive to potential buyers. Making a few simple renovations to your kitchen can significantly raise your home’s value. The renovations need not be expensive as a few simple changes such as using neutral paint or buying some modern appliances will help you achieve the look you are going for. 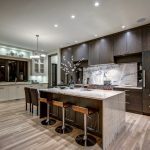 Come and visit our kitchen showrooms in Calgary and Canmore to see what can be done or to consult with our design team to get your dream kitchen started today!